Pakoras, bhajji, pooris, kurdya, papdya, papad… anything fried had become a tetchy taboo in our home for many years. A diabetic dad who wouldn’t heed his health savvy wife was not a combination conducive to such indulgences. In her losing battle to keep him healthy, Aai avoided frying stuff. She even placed a prohibition order on most traditional “kulachar” such as “Navratri” and “Mahalakshmis” or “Gauri” pooja that involved extensive cooking with all white venoms like sugar, flour and fats. The only exception was Diwali, but this celebration too was not without some healthy trade-offs such as baked karanjis or kheer with saccharine. Yes, we used saccharine. On those very rare days when this embargo was eased a bit, we would get to enjoy oily bhajis- limited only by our imagination. Each one of us had our favourites among the fritter fraternity. Mine were the potato bhajji, though I really don’t like them much these days. Silly me, I should have known better to keep mum about it and just munch on them, than to shoot my mouth off and then get teased mercilessly for being fat and spudsy. Dada was partial to “khekda” bhajjis or the sliced onion ones. It was quite characteristic of him… wiry, spicy and crisp. Aai was all for the hardy, earthy eggplant or ghosala (silk melon). If it happened to be the monsoon season, she would send us out to pluck some “kena” leaves (dayflower, or spiderwort) growing wild as weeds. The small heart shaped fleshy and furry leaf would make an interesting puffy patta pakori. I now realise how Aai would fall for this trick. There was something very charming about Baba’s way of appealing to her sense of adventure. Some of these bhajji requests challenged her to think out of the box. I have seen her triumphantly producing a tomato bhajji after she deftly dipped the juice-dripping wedge into the batter and managed to fry it without the hot oil protesting too much. Only Aai’s son-in-law could match this feat of hers. His friends can never tire of telling tales of his “dahi-bhaat” bondas. It’s believed that after everything in the pantry that could possibly endure the trip from the batter into the hot oil had been used up, he resorted to dipping balls of pre-mixed curd and rice into the batter to use it up. And of course, to use up the oil. That was Baba’s “bahana” too, for waiting till almost the end – end of all the varieties of bhajjis, his allowed quota and her limited good cheer. He wanted her to fry those risqué bhajjis without risking getting burnt or messing up the oil. That’s right. Blame it all on oil. 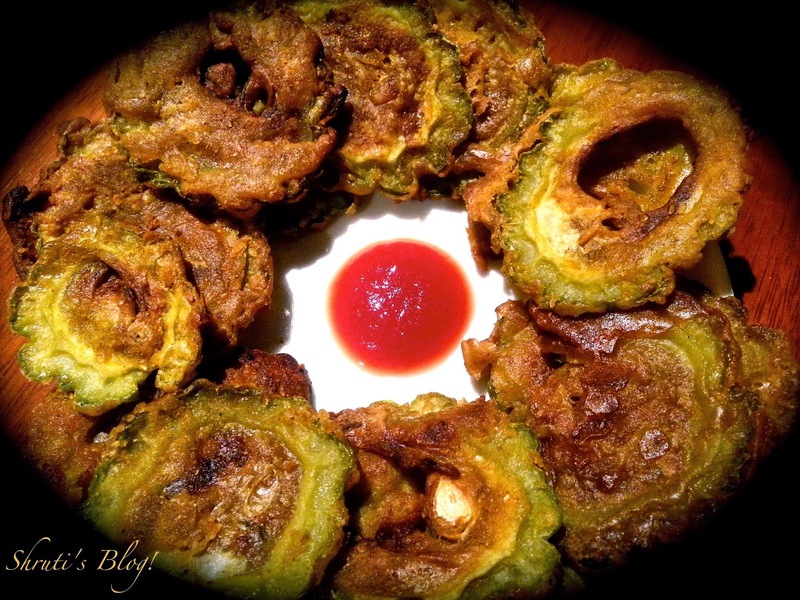 This post was written in my mind much before I got down to typing it up- as I baked these karela bhajjis, in a healthy fit. The well-oiled wheels of time have come a full circle. Wash and dry the karela thoroughly. Trim the tips and cut the karela into thin slices. In a bowl, mix the rest of the ingredients into a thick paste. Dip the karela slices into the paste and make sure both the sides are completely coated as much as possible. You have to spread the batter thinly, as too much batter will mean soggy fritters. Line a baking tray with parchment and spray some oil onto it and spread the battered karela slices evenly and thinly. Spray the topside with some more oil once the slices are placed. Preheat the oven to 200 C and bake the karela slices till crisp. You may want to flip them half way through, but it’s not really necessary. I baked the slices for around 30 minutes and then turned the heat down to 180 for another 10 minutes. 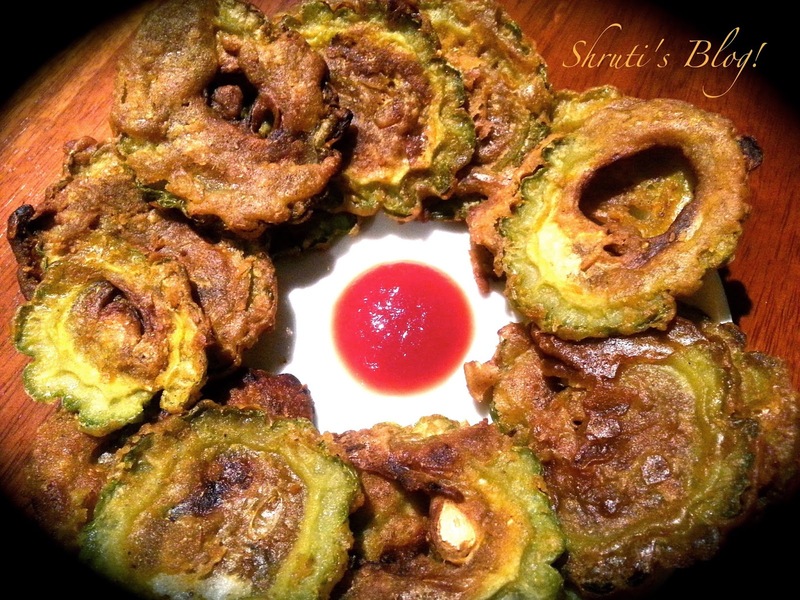 Remove the fritters from the oven and serve hot with tomato sauce or a green chutney. Good one Shruti! And Karle is good for diabetics.